Since the earliest fossil discoveries, the public has been thrilled by the thought of dinosaurs, excited to think that such huge and sometimes ferocious creatures once walked the earth. When the Crystal Palace was relocated to Sydenham in 1854, one of the most popular attractions was the Mausoleum to the Memory of a Ruined World, which featured life-size dinosaurs made from concrete. They were based on the work of the palaeontologist Richard Owen who had coined the term 'dinosaur' in the 1840s. A palaeontologist is someone who studies fossils in order to understand the past. Owen was acclaimed for this ability to deduce the appearance of an animal on the basis of a single fragment of bone and he used this skill to work out what dinosaurs looked like from incomplete fossil remains. 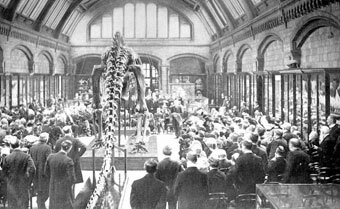 Presentation of the first replica diplodocus to the trustees of the British Museum of Natural History, May 12, 1905 (Wikipedia). By the early 20th century, casts of dinosaur skeletons were being shipped around the world so museums could erect replica displays for the public to see and wonder at. The first dinosaur to be shown in this way is thought to have been the diplodocus, a long-necked and long-tailed herbivore first discovered in the 1870s. The diplodocus is one of the most recognisable dinosaur shapes, and was the star of an early animated film, Gertie the Dinosaur, made in 1914. 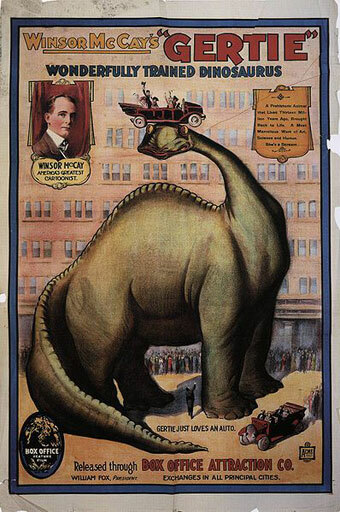 Poster for Gertie the Dinosaur (Wikipedia). 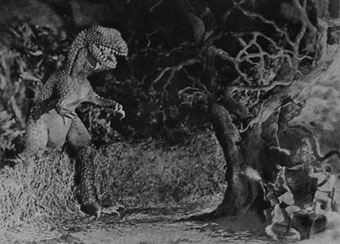 Conan Doyle's The Lost World was first filmed in 1925, featuring stop-motion animation by Willis O'Brien. This is the type of animation used by Aardman Animations for the Wallace and Gromit films. The Lost World was the first in-flight-movie, being shown on the Imperial Airways' route from London to Paris. Stills from the 1925 version of The Lost World as featured in the Illustrated London News (Bristol Libraries). 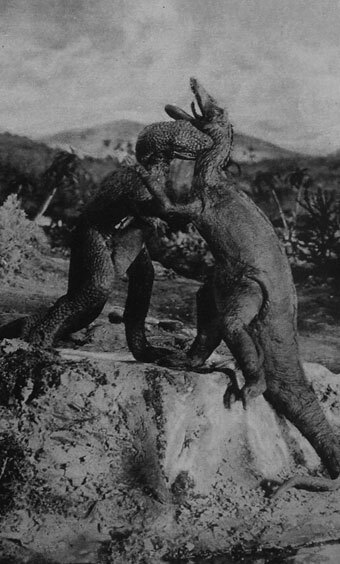 O'Brien went on to do the stop-motion animation for King Kong (1933) which featured a battle between the out-sized ape and tyrannosaurus rex, a fierce carnivore. 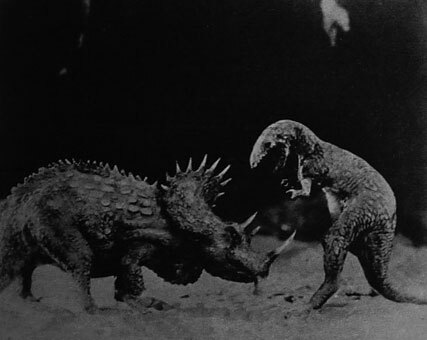 Stop-motion was also used in later dinosaur films including Journey to the Centre of the Earth (1960), based on Jules Verne's novel, and One Million Years BC (1966). The technique has been surpassed in terms of "authenticity" by modern-day computer-generated imagery (CGI) first seen to stunning effect in Jurassic Park (1993) in which dinosaurs were seamlessly integrated into live action scenes. This film was based on a novel by Michael Crichton about dinosaurs being brought back into existence using DNA preserved in amber. Crichton's sequel was entitled The Lost World but has no relation to Conan Doyle's original work. 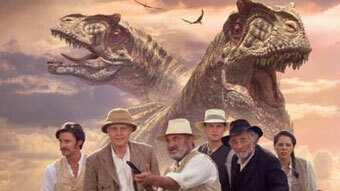 Publicity image for BBC TV's 2001 version of The Lost World. There have been plenty of animated dinosaurs to be seen on television too, ranging from the 1960s sitcom The Flintstones, the educational Barney and Friends, the BBC's award-winning documentary Walking with Dinosaurs (1999) and The Lost World (2001), another adaptation of Conan Doyle's classic novel. Dinosaurs also feature in children's toys, comic books, birthday cakes, greetings cards, block-buster exhibitions, advertisements, theme parks, T-shirts, posters... They may have died out millions of years ago, but, thanks to Conan Doyle's The Lost World and other cultural works, dinosaurs look set to live on in our imaginations for many more years to come, a potent mix of scientific fact and delicious fantasy. 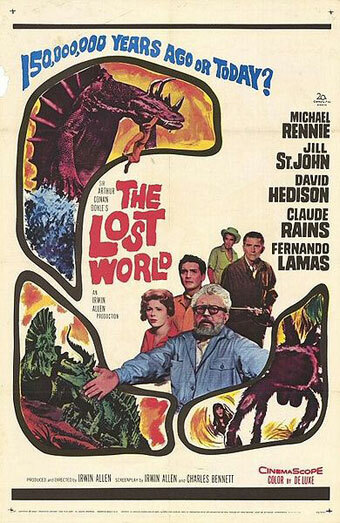 Poster for 1960s' film version of The Lost World. You can find out more about some of the real-life inspiration behind The Lost World in the readers' guide on the Downloads page. 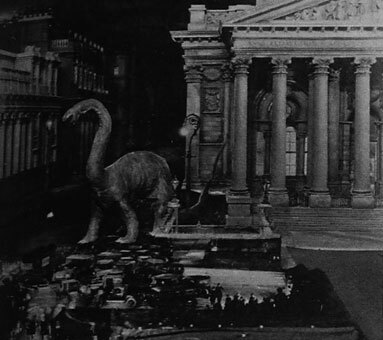 Stills from the 1925 version of The Lost World as featured in the Illustrated London News (Bristol Libraries). Find out more about the film at the website Silent Movie Monsters.